﻿Last year the venerable BBC ran the radio programme “A History of the World in 100 Objects”, created in collaboration with the equally venerable British Museum. It is a terrific 100 part series that chronicles the history of the world by examining 100 different objects – one item per 15 minute episode – from the British Museum’s collection. Each episode details how an object, even one that is immensely ordinary, shaped history and countries. The series is fascinating and vast in its scope, but presented in an accessible manner. 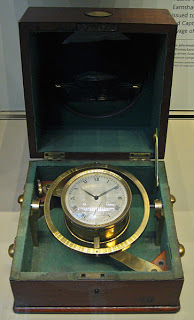 Episode 91 was dedicated to a marine chronometer, specifically a clock (there were 22 of them onboard) from the HMS Beagle – the ship made famous by Charles Darwin – made by Thomas Earnshaw, circa 1800. You can listen to the programme or read the transcript.